Need to be seen at night? Try our prestriped line of Engineer Grade or High Intensity Reflective Tapes. These tapes offer vibrant daytime visibility with reflective properties for night time use. All tape is rated for use outdoors for a 7-10 year life span. Tape has an aggressive adhesive that will adhere to almost any clean, dry, smooth surface. 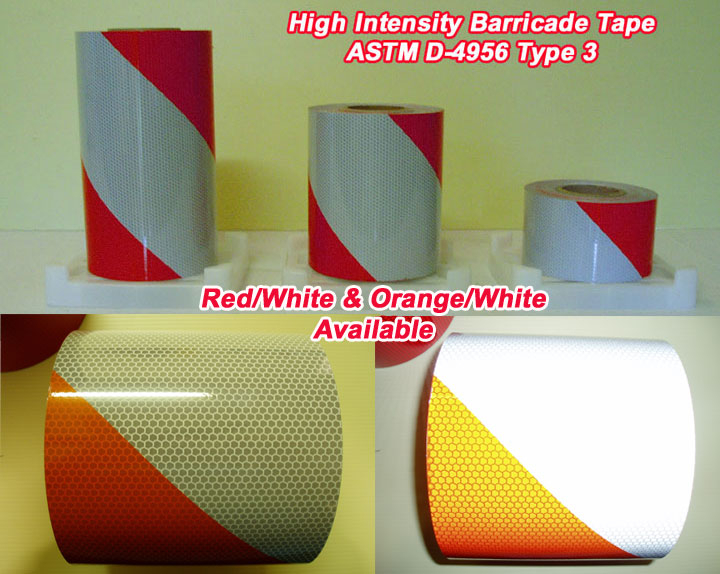 This tape is commonly used to build barricades, barriers and also for vehicle conspicuity. Both colors of this tape reflect. The stripes are set to a 45 degree angle and are 6" wide. They are available in a left slant (L6) and a right slant (R6). A left slant means that traffic should pass to the right and a right slant means that traffic should pass to the left. For many applications the slant direction does not matter. Our reflective safety tapes MEET ASTM D-4956-99 Reflectivity Type I requirements for engineer grade and Type III requirements for high intensity grade.